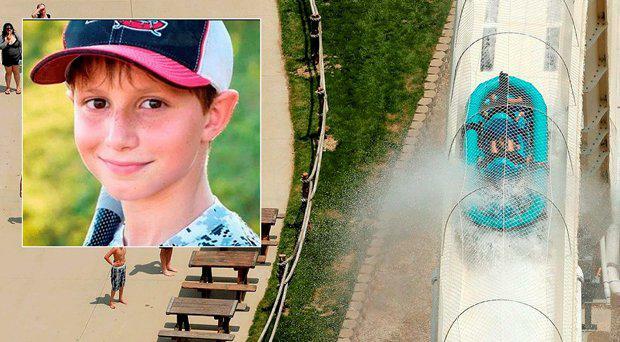 Caleb Schwab, 10, was killed in the incident at the Schlitterbahn Waterpark, which is located about 15 miles west of Kansas City, Missouri. The parents of a 10-year-old boy who was killed on one of the world's tallest slides have spoken out about their son's tragic death. Caleb Schwab was killed on the Verruckt raft ride at the Schlitterbahn Water Park in Kansas City, Kansas. Verruckt, German for "insane", featured multi-person rafts that make a 168ft drop at speeds of up to 70mph, followed by a surge up a hump and a 50ft descent to a finishing pool. Caleb's parents, Republican state congressman Scott Schwab and his wife Michele said "six of us went to the park and five came back". In an interview with Good Morning America, Scott and his wife, Michelle, recalled the moments before Caleb and his 12-year-old brother Nathan went to the top of the 170-foot slide. “Before they took off I said, ‘Brothers stick together’ and (Caleb) said, ‘I know, dad,’” Scott told Good Morning America. Caleb's brother Nathan went down the slide first and began screaming after Caleb was injured. Mum Michelle said she rushed to the scene but was stopped by a man who told her not to go any further. The family's worst nightmare came true when they were told their son was dead. "It’s an accident, but there is an accounting because someone was negligent," Scott said. "We’re still hurting but we’re going to be okay."